I think this new pattern editor is breaking the ability to record pitch bend commands from the midi keyboard. It's either that or the polac VST loader (was build 27 and I updated to build 29). I updated both at the same time. Normally to do this, I go to columns and check the box next to my synth. Then I set the pattern to the desired length and hit record. However, it does not record any pitch bend data when I do this. Notes are still recorded normally though. I've been having pitch wheel problems for a while too, It's been happening before installing the pattern xp mod, so I'm guessing it's a problem with build 29 of polac vst loader. What are you trying exactly, record pitchbend to pattern xp's own pitchbend column(is this even possible?) or the loaders own track parameter column(then set to 0x30FE for pitchbend automation)? 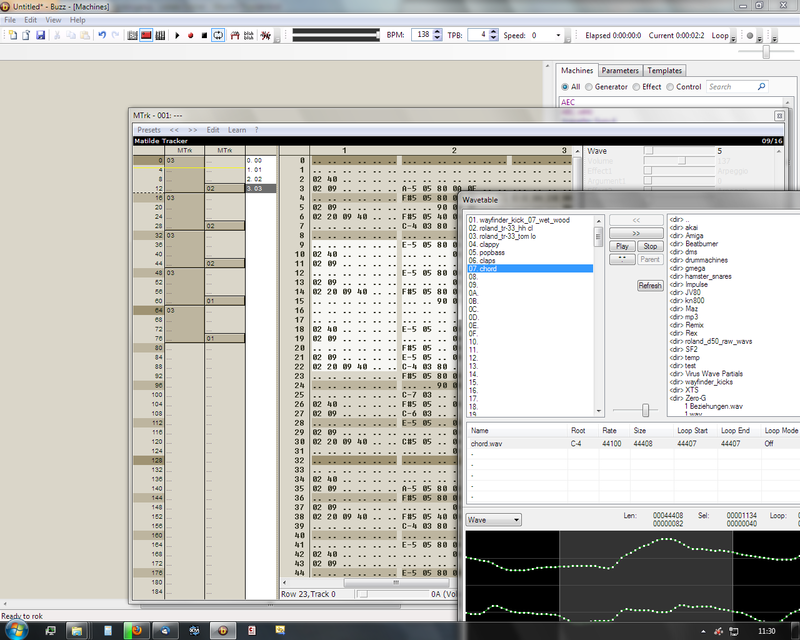 Nevermind it is working properly, I was indeed trying to use the midi pitch column in pattern xp instead of 30FE in the track parameter column. Previously it would be recorded in the MIDI Pitch Wheel column when I played from my MIDI keyboard and used the pitch wheel. Attached is an image of a pattern in a previous song I recorded. I just confirmed it is not the PVST version that is causing this by reinstalling the old version (build 27), so it must be the new pattern editor. Holy wow! Frustrations getting my MPD to work with samples led me to finally getting this to handle vsts. I install it and load buzz, and there's machine entries for all my midi equipment!? I've been using midi-ox to merge my midi inputs, and I can tell this is going to simplify that whole situation, which is good because I also use guitar rig, and it doesn't like midi ox. Plus some bitchin 64 bit effects! I have a lot to learn about this piece of software but it's christmas up in here oh yeah. Hello, you can check the users forum if you'd like to see the crash I was getting from anomalous sysx data. I have a question though. Now that I've gotten this midi controller working, my next task is to get my faders and knobs working outside the vst I'm working with. I use these controllers for physical control of filter cutoff when I'm playing keyboard and things like that. I figured out that I can just send the midi from polac midi bus to whatever machine I want so long as it is wrapped within the vst loader, however I ran into one problem. I put my copy of fsm infector in there and when I did so none of my presets loaded. I tried manually loading them but had no luck. I also tried selecting them by number, but that didn't work either. Some settings adopted the values they had in my preset and some did not. Also, I am curious about whether it would be possible to have midi changes in parameter setting reflected in the gui, as is the case in buzz itself. When I'm mapping a lot of parameters, it can be helpful to see which one is bound to which controller just by moving it, and also when I return to an older piece of music and I'm looking at my automations, I get the most intimation from just watching the slider move back and forth to get a sense of the kind of expressive sound gesture I was trying to make, if that makes any sense. I use buzz and Polack vst live on stage and are going to change computer from 32 bit to 64 bit. If I install x64 can I use all my 32-bits VST plugins then? Without using Jbridge? Yes, the loader comes with its own vst bridge so you can use the 32bit plugins in a 64bit Buzz too. Buzz and your VST-loander is fantastic. Kep up the good work! "Sir" Xlutop, are you willing and able to tranfer the Waveeditor/ Wavetable you created for the use with Matilde2 (rc 1.98) to Matilde3 (rc 1.10), so that we can use it directly with a Multiout-option? added on 09-02-2015: Does it help if I say: "Please"? Inertia seems to follow Param Slide. In other words, say you have the inertia turned off and do a param slide of speed 0200. Refresh the settings GUI and the inertia will be 2 ticks. Not a huge deal as you can just set inertia back but it takes up a row to do so.